One of the biggest pieces of advice I always have for students as they enter the workforce is to do their best to spend as much time as they can around senior management. Ideally, you will get to interact with your CEO or C-level executives and when you do, be very attentive to what they do and how they act because obviously, they are doing something right and there is always something you can learn from them. I recently had the pleasure of sitting the CEO of a Canadian biotech company at an industry function. Having not had much prior experience in biotech, it was great getting his perspective on the business. I was also interested to hear about how he allocates his time and for companies in their earlier stages means lots of time spent searching for financing. His biggest piece of advice was that you have to work hard to be part of the "in" crowd. This advice is sure to draw many reactions from people and I'm sure some of them will be negative. What is this, high school? Who wants to be part of the "in" crowd anymore? Who wants to be part of a crowd when you can be different? I'm already part of the "in" crowd! 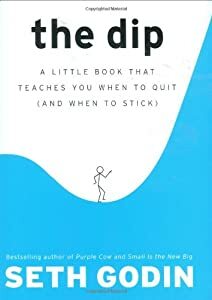 Personally, I was a little taken aback at this advice but then I started to think about what I have been reading in Seth Godin's book "The Dip". To sum up what I have read so far: Anything worth doing is worth doing to be the best at because being the best has advantages that are exponentially greater than being second best, or worse. To be the best at something means that you have to persevere through "The Dip" which is that long trough on the results/effort scale where you start to realize diminishing returns but this Dip is only temporary and happens after your initial success and before the remarkable long term success that comes with being the best at something. Now that we have that out of the way, here's how I connected the two. If everybody was part of the "in" crowd then it wouldn't exist because it would just be "the crowd" or more simply, everybody. One of the most classic rules in business and one that is echoed in "The Dip" is that scarcity breeds value. Therefore, there are advantages to being part of the "in" crowd and for people trying to come up in the world, whether it be to get a better job or grow their business, being part of the "in" crowd has many of the advantages that come with being the best at something. For small companies, these advantages might mean an easier access to financing. For young employees looking to move up in the world, it might mean faster promotions. I'm sure that we all work with people that we feel spend more time schmoozing than working and while I think that is never a good situation, I think that you need to be actively working to make sure you're part of the "in" crowd at your workplace and your industry. Let go of any negative associations you might have about the "in" crowd and embrace what membership might be able to do for your or your company.